Finally, got to write a post after a week or so, thanks to all my Guest Posters who contributed some wonderful posts all this while. I hope you’ve checked March’s Traffic Stats. In that I’ve added a special paragraph for the Traffic Sources. If you take a closer look at it, you’ll find that almost 52% of the traffic comes from search engines. Actually that number is quite less when compared to various other blogs in my niche. The reason for it is Keyword Research. Till last month I just used to write posts and publish it. I never used to really concentrate on Keyword Research (i.e. using a tool like Google Keyword Research Tool). Meanwhile, take some time to read the basic SEO Tips you must follow on your site/blog. During an in-depth research I found that it was essential for me to do some Keyword Research before I post. So I followed that thing during the end phases of the previous month & got considerable amount of success with it. That doesn’t mean all my earlier posts don’t bring in visitors from search engines. If they weren’t, then we would never have got such an awesome stat report. Once you research for Keywords with low competition and high clicks, the next thing you want to see is how your post or blog ranks for those keywords. In technical terms it’s called Search Engine Ranking Position. Most of us use Google Webmaster Tools, to track the Search Engine Ranking Position for Specific Keywords. GWT gives an extended report which includes the change in the ranking position, impressions received & clicks. In Q3 of 2010, GWT introduced Keyword Variants which helps us to find, how many times we’ve used a particular keyword in our posts (i.e. Interlinking). But what if you want to track the Search Engine Ranking position from WordPress Dashboard itself ? Well, you no longer need to worry about it; as SE KeyRanker will help you in tracking the ranking position for Specific Keywords. Couple of days ago, in the official WordPress plugins Dashboard widget I saw SE KeyRanker in the newly released plugins category. The name got me interested and I checked it’s description in the WordPress Plugins Directory. Impressed with it’s working, I decided to give it a try. This plugin determines the ranking position based on the localization we set. So, if you want to track the Search Engine ranking position in Google India, then you must set the localization to google.co.in. The beauty of this plugin is that, it allows you to set multiple localizations. 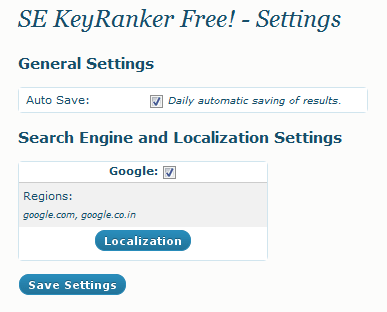 So, go to WordPress Directory and download SE KeyRanker Plugin [LINK]. Check out both the images, in case you face any problems in configuring it. You are free to comment as well, if you’ve any doubts. Also, take a look at the Top 10 WordPress Plugins I use on DailyBlogging. Do you use any other plugin which gives the same result (Alternative) ?? will look at it .. Seems good . This is an awesome piece of work! Also thanking you for letting me know that GWT can also track search engine position! I used to use iwebtool’s search engine tracker for finding positions! It seems like a cool plugin. I’ll have to try it out. Does it display ranking for individual pages, or for the blog as a whole? Very nice plugin for wordpress. You know I’m shortly going to start my own blog on wordpress and meanwhile I’m collecting all information about wordpress. very useful plugins for WordPress blog, thanks for share Mani! never knew there was a wordpress plugin. Have been using webmaster tools all these days. This plugin seems very helpful. I’ll give it a try. Thanks for giving info about it. Nice post though I myself still prefer to use GWT for this as using the wordpress plugin adds to the performance. So I am trying to keep the number of plugins as minimum possible though its a nice plugin other wise for checking the rankings. SE KeyRanker looks good. Will check it out later! I didn’t get your problem. The plugin loads pretty well hear. Hmmm a great plugin in deed well mani can you tell me about a plugin,which can help me pick out some less competetive keywords relavent to the post. you can try Keyword Density Checker. It will suggest you some keywords which you use more no. of times in a post. I would recommend to not blindly use those suggestions but to research on those keywords using Google Adwords Tool. Nice find and plugins looks really useful. Are you still using it? How’s the performance effect of this plugin and anything which you would like to say after using it for longer period?